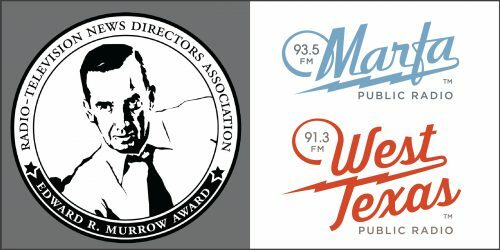 For the second year in the row, Marfa Public Radio (along with West Texas Public Radio) is the most awarded small-market station in the nation during the regional Murrow Awards for excellence in journalism in 2015. Thanks to all our donating members who make this work possible. The 2016 Edward R. Murrow Awards recognize the best in journalism – radio, television, and online – both commercial and non-commercial media. They are named after Edward R. Murrow, a pioneer of broadcast news on CBS radio and television. We compete in Region 6, where we won top honors in eight categories. Regional winners advance to national competition, with results in June. In addition to our regular news team – Lorne Matalon, Travis Bubenik, and Tom Michael – we take pride in mentoring interns. So it’s no surprise, for our our win for Overall Excellence, there are contributions from former interns Mia Warren and Anna Rose MacArthur. And our winning News Documentary, compiled by Asa Merritt, includes reports from Ian Lewis and Katherine Rae Mondo – all interns last year. This entry was posted in KRTS News and tagged Murrow Awards. Bookmark the permalink.